There are many benefits to having Live Aquarium Plants. Other than making the home aquarium aesthetically pleasing, plants also help to create a natural living environment for different types of fish by enhancing the water quality. First of all, it helps to improve the oxygen level in the water from photosynthesis and at the same time, it also consume harmful ammonia and nitrite in the water and convert it to less harmful nitrate. Other than that, plants also help to provide shelter for certain fish especially Neon Tetra, which are rather shy. Fish also rely on plants as a hiding place especially during mating season and with a place to hide, they will not easily get frightened or shocked. Those who have decided to go ahead with their plans to have live plants will find that well-planted aquarium looks so much nicer and attractive compared to previously when it was just a barren, dull looking empty aquarium. Realizing the endless benefits, the question next is how do we successfully grow live aquarium plants? Well, first and foremost requisite is of course there must be reliable light source. There are two options here, one is to rely on natural sunbeam by placing close to windows but another better option is to use artificial aquarium lighting using fluorescent tubes. The latter option is more preferred because unlike sunbeam, artificial lighting does not generate high intensity light which attracts algae growth and secondly, artificial light can be controlled according to requirements such as having day and night cycle at different interval period. Other than light, you will also need to have gravel or substrate to hold the plants so that they can grow well. My recommendation is try to use sand or fine gravel and supplement the aquarium bed with natural plant nutrient supplement available in your local fish shop. The nutrient together with waste generated from fish will be used as food for plant growth. Don’t worry much about it because once the plants establish its roots, it will develop a natural equilibrium with the environment and create a well-balanced ecosystem in your tiny little aquarium community. Let’s discuss here some of the most common live aquarium plants. 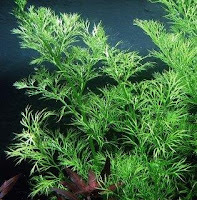 One of the easiest live aquarium plants to grow which does not need much attention. It produces light to dark green leaves shaped like spearheads. The leaves can grow up to very long and width reaching almost 7-8 inches in length. Because of this attribute, it is best used as a backdrop to complement the smaller-sized plants in front. 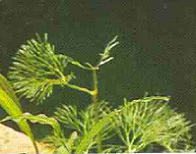 Water sprite is a fast-growing plant with soft and fragile leaves, which is also deeply forked and bright green in color. It usually grows in floating form but it can also be embedded in gravel. The plant prefers acidic environment and grows well in shaded areas. As such, perfect plant to fill up the tight spots. Cabomba is a very delicate and fragile plant as its leaves can easily fall apart especially in an aquarium with high turbulence of water. Formerly known as fanwort because of its appearance, the leaves look like a lacy fan spread around the stem covering every angle. Similar like water sprite, the plant is also fast-growing. One thing you should also remember is that, similar like your fish, plants are also sensitive to changes in water parameters. 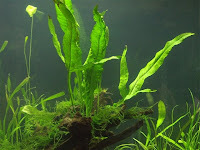 Different aquarium plants will require different water conditions and as such it is imperative that you find out more information about the plant such as the pH and water hardness level including lighting intensity required for each individual species. Finally, to put on the creative touch and create a stunning looking aquarium, try and work out different aquarium plants combinations and arrangements with most simple is to have them arranged in such a way that the smaller ones are in front while those with big leaves are behind. Also don’t forget that certain fish may not like or suitable with having a well-planted aquarium, a good example would be Goldfish and Silver Dollars because they are known to uproot and eat the plants.